In a clash between Texas law and the federal Voting Rights Act, a federal judge has stopped the state from enforcing an obscure election provision regarding interpreters. Mallika Das, a U.S. citizen who was born in India, walked into a Williamson County polling place in 2014 eager to cast her ballot. Because she was not proficient in English and had found it difficult to vote in the past, Das brought her son, Saurabh, to help her. They both spoke Bengali, an Asian dialect. But when Saurabh told poll workers he was there to interpret the English ballot for his mother, the duo ran into an unexpected requirement. By law, a poll official determined, Saurabh could not serve as an interpreter for his mother because he was not registered to vote in the county. Saurabh was registered to vote in neighboring Travis County. Das proceeded to vote without her son’s assistance but was unable to “vote properly” for all of the electoral measures because she could not “sufficiently comprehend the ballot,” according to a lawsuit she later filed. Das died before the lawsuit was resolved, but her dilemma, laid out in court filings, is part of an ongoing legal battle over a little-noticed provision of Texas election requiring interpreters to be registered voters in the same county in which they are providing help. Ahead of the November election, a federal district judge has blocked Texas from enforcing that provision, ruling it violates the federal Voting Rights Act. Texas is appealing that ruling to the U.S. 5th Circuit Court of Appeals. The requirement will not be in effect during the upcoming election. The Secretary of State’s office has updated poll worker training material to be consistent with the ruling, said spokeswoman Alicia Pierce. And voter education groups that focus on language-minority voters like Asian Texans are working to ensure that voters get the word they can bring just about anyone, including their minor children, to help them vote. But the case has highlighted a provision of Texas election law that appears to be at odds with federal protections for voters unable to read or write in English. At the heart of the case is whether voters are expected to know the difference between an “interpreter” and an “assistor” in the eyes of Texas election law. The federal Voting Rights Act requires that any voter who requires assistance because of visual impairments, disabilities or literacy skills can be helped in casting a ballot by the person of their choice, as long as it’s not their employer or a union leader. A separate provision allows voters to select an "interpreter" to help them communicate with an election officer and “accompany the voter to the voting station for the purpose of translating the ballot to the voter.” The interpreter, unlike an assistor, must be registered to vote in the same county. Had Das’ son simply told poll workers he was “assisting” his mother — not that the assistance involved interpreting the English ballot for her — he would have been able to go into the voting booth with her, according to her lawyers. “On its face, we knew [this requirement] violated Section 208 of the Voting Rights Act,” said Jerry Vattamala, director of the Asian American Legal Defense and Education Fund’s democracy program. AALDEF brought the lawsuit on behalf of Das and the Greater Houston chapter of the Organization of Chinese Americans. The provision complicates the ability to cast a ballot for those limited English proficient voters who may bring a minor child or grandchild to help them through the voting process. “Obviously a minor can’t be a registered voter, so it’s problematic,” Vattamala added. U.S. District Judge Robert Pitman in August agreed, saying the Texas interpreter restrictions “flatly contradict” the Voting Rights Act, restricting a voter with limited English proficiency by “arbitrarily” requiring the interpreter to be registered to vote in the same county. In court filings, the state has argued it should not be part of the lawsuit because it stems from a “local dispute” involving an “alleged miscommunication” between Das, her son and a Williamson County poll worker. Asked about the reasoning behind the law, the Secretary of State’s office deferred to the Texas Attorney General, which is representing the state in the lawsuit. A spokeswoman for the AG said they could not comment on pending litigation. The requirement could affect thousands of voters. Das’ family was among the millions of Texas households that speak languages other than English. 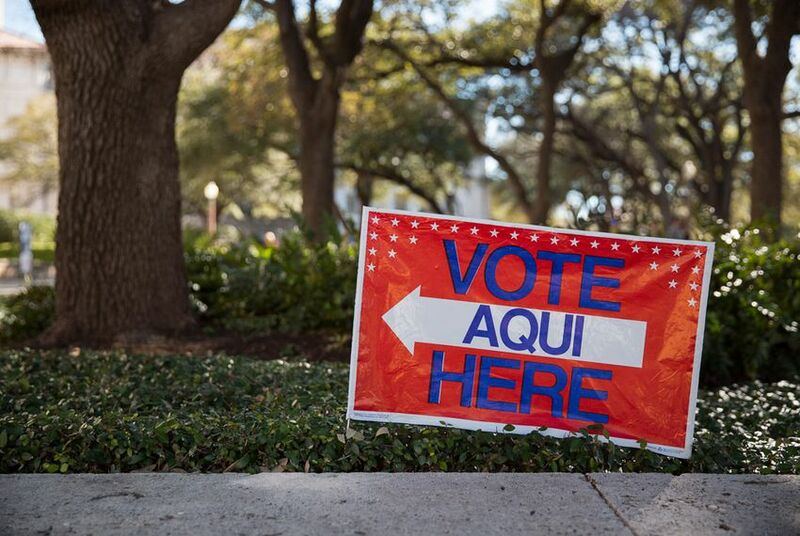 Most speak Spanish, and voting sites in Texas are required to provide electoral materials in Spanish. But 25.7 percent of Texas households that speak Asian or other Pacific Island languages are considered limited English-speaking households, according to recent U.S. Census estimates. Almost 27 percent of households that speak Indo-European or other languages are limited English-speaking households. Texas Attorney General Ken Paxton asked the U.S. Supreme Court to hear his arguments about why the state’s photo ID requirements for voting do not discriminate against Hispanics and African-American voters.